When the weather gets cold enough, exhaust from vehicles and homes becomes a very visible mist in the air. Is all that vapour simply more visible to the eye, or is the level of pollution actually greater in the winter? The answer is yes to both questions. Some sources of pollution, like industrial emissions, stay fairly constant throughout the year, no matter what the season. But roaring fireplaces and wood stoves and idling vehicles in the winter all add up to higher levels of particulate matter (the particles that make up smoke) and carbon monoxide (from vehicle emissions). On top of this, cold temperatures and stagnant air have a way of creating a build-up of these substances near the ground, particularly during a weather phenomenon called temperature inversions. In other seasons or weather conditions, warm air sits near the ground and the air can rise easily and carry away pollutants. 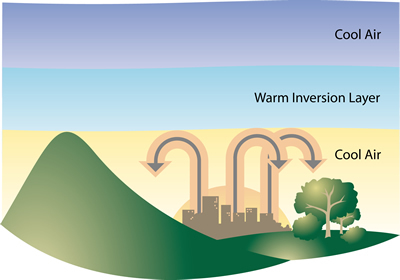 In a temperature inversion, cold air is trapped near the ground by a layer of warm air. The warm air acts like a lid, holding these substances down. During a temperature inversion, smoke can’t rise and carbon monoxide can reach unhealthy levels. From an air quality perspective, storms are a welcome weather event. Wind, rain and snow storms are sometimes called scrubbers because they help clear out and disperse substances of concern. Most of the time during the winter, the ambient outdoor air quality in the Fort Air Partnership airshed stays within good or low health risk ranges, as measured by the Alberta Air Quality Health Index. If AQHI readings do increase in the winter, it’s generally due to the temperature inversion phenomenon. Indoor air quality also becomes a greater concern during the winter because of the amount of time that people stay inside with poor ventilation. Without adequate circulation, carbon dioxide levels can become an issue, leading to headaches and lethargy. Generally, outdoor air quality is better than indoor air, so the best antidote is to get outside regularly, open windows for short periods if possible and keep fireplaces and ventilation systems clean and maintained. This map shows that while Alberta’s nine airsheds cover 90% of Alberta’s populated areas, there are significant gaps particularly in east central and northeast Alberta. Fort Air Partnership, under the auspices of the Alberta Airshed Council, is working with other airsheds to recommend to the Alberta government how these gaps should be filled.